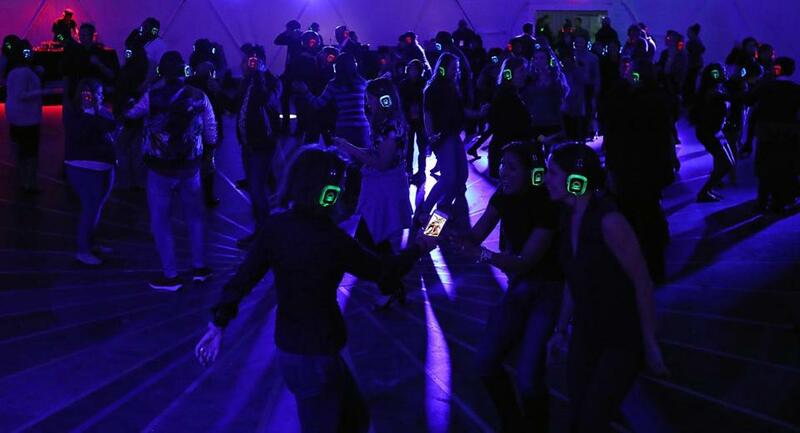 Headphone-wearing partygoers dance at “Live Silent Disco” Thursday night at City Hall Plaza, where three DJs played. Different colors indicated which DJ were listening to. The event was part of Hubweek. You wouldn’t have known it if you were standing right outside HUBweek’s Green Dome, but a dance party was in full swing in the middle of City Hall Plaza Thursday night. 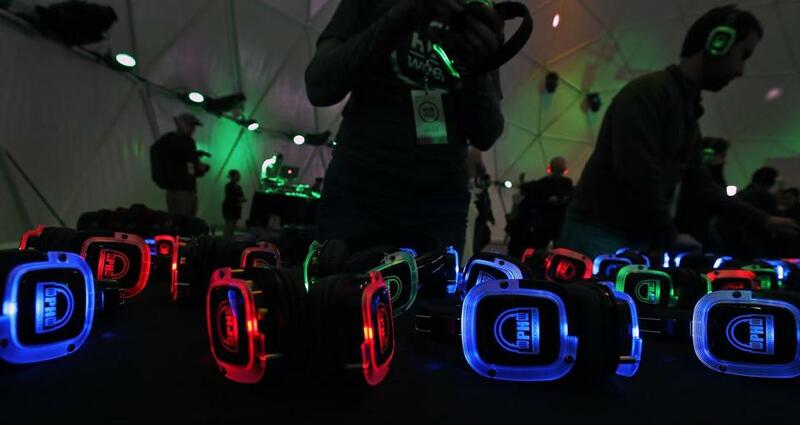 Three different DJs channeled music into light-up, wireless headphones worn by partygoers at the Live Silent Disco. A switch of the headphone channels changed up the music. 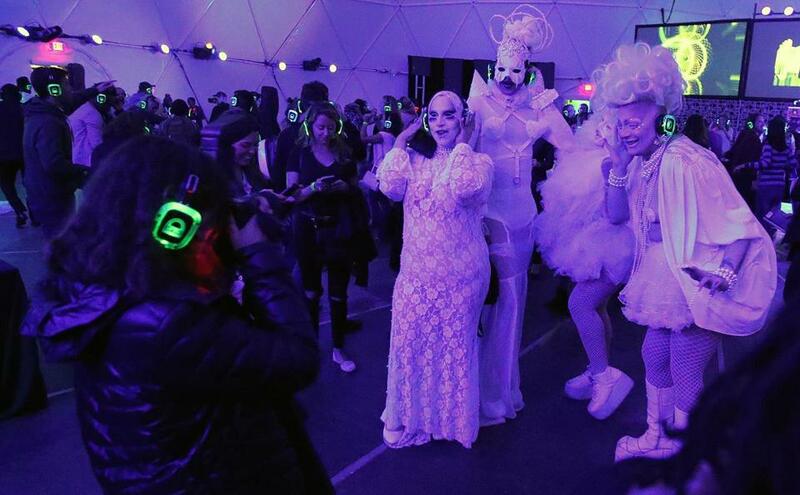 Each DJ had a different color — DJ Candy Raine was blue, Bobby “Bangers” Renteria was green, and DJ Savuth, red — that lit up the headphones, so attendees knew who their friends and fellow partygoers were listening to. But take the headphones off for a moment and all you’d hear were some claps, shouts, and off-key singing along to a song you couldn’t hear. 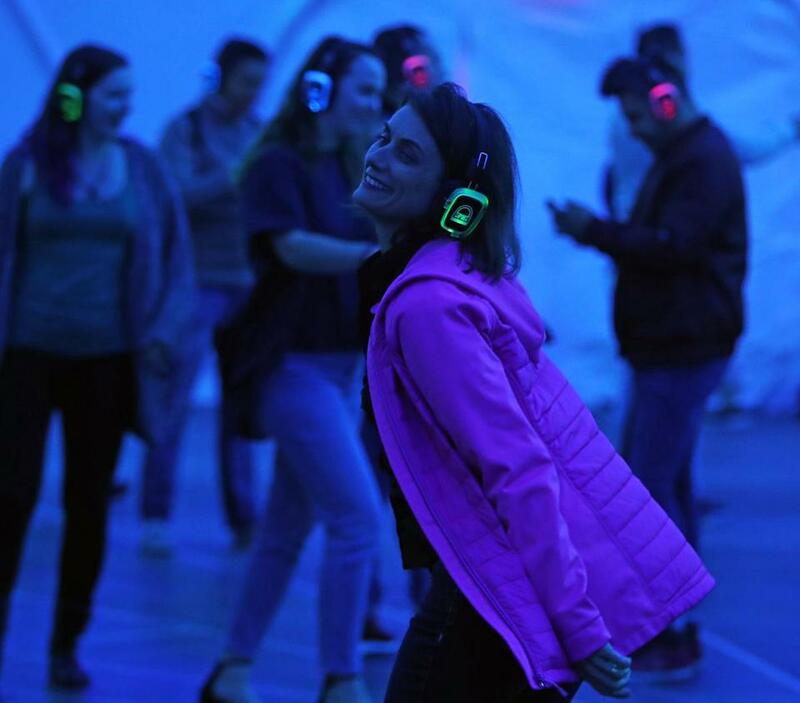 One of the late-night Immersion parties at HUBweek, Silent Disco was hosted in partnership with The Boston Art & Music Soul Fest. The HUBweek innovation festival, now in its third year, was founded by The Boston Globe, Harvard University, Massachusetts General Hospital, and MIT. Partygoers varied greatly in age; white-haired couples partner-danced while children raced past them, diving around groups of grooving 20-somethings. Yuna Cao, 25, was part of a group of four enthusiastic friends who excitedly shouted to each other to switch channels whenever one found a new favorite song. She said she’d learned of silent parties from a scene in Netflix’s “Atypical” and had wanted to attend a silent disco ever since. “All of us wanted to try it all the time and never got the chance, so we’re having fun,” she said. Sharman Lappin, 65, of Somerville said she loves to dance but isn’t usually able to because her triathlon training schedule requires her to be up early in the morning and most club nights are late at night. “I like dancing, and I like finding people dancing at the same rhythm,” said Brian Rivas, 24, a real estate agent in Boston. “You find people dancing on the same channel. I like the option of changing. And watching this guy dance like a clown,” he said, gesturing at his friend. Jessica Cole, 45, a writer in Jamaica Plain, had her cousin visiting from New York this weekend, who had been to a silent party before and wanted to go. They brought Cole’s son, Dylan, 6, and her nephew, Asa, who’s 5. Kaitlyn Locke can be reached at kaitlyn.locke@globe.com.